Although historians are unable to agree among themselves as to the designer of the first really successful helicopter, there would seem little doubt that credit for this feat is the right of Professor Heinrich Karl Johann Focke of the Focke-Achgelis G.m.b.H., one of whose helicopter designs, the Fa 223 Drache (Dragon), was intended for convoy protection, minelaying and transport duties, and actually reached mass-production status during World War II. 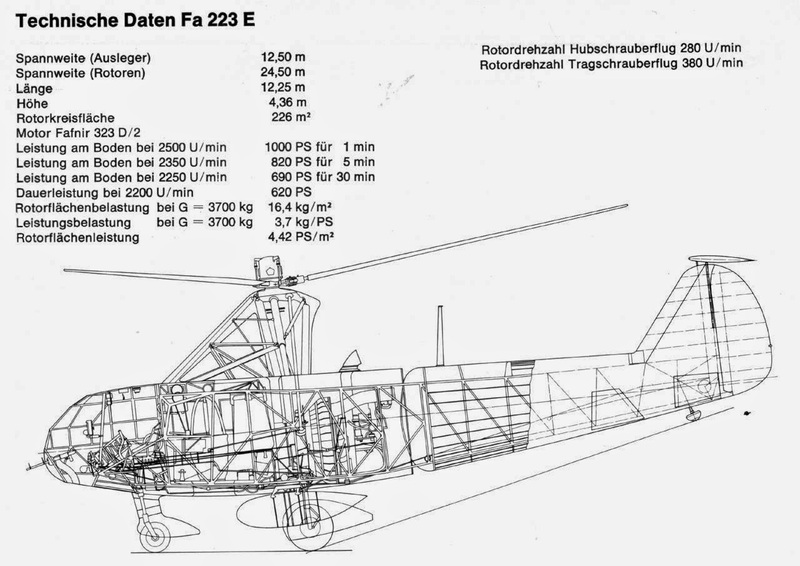 The Fa 223 Drache was an extrapolation of the Fa 61, development of which had actually been initiated by Professor Focke as early as 1932. Employing the fuselage of a standard Fw 44 Stieglitz primary trainer, the Fa 61 was flown for . (he first time in free flight on June 26, 1936, and soon established a number of world records, These included an altitude record of 11,242 ft., an endurance record of 1 hr. 20.5 min., a distance record of 143 mls" and a speed record of 76 m.p.h. 1n 1938, Hanna Reitsch demonstrated the Fa 61 inside the Berlin Deutschland-HaIIe, illustrating the ease with which the helicopter could be controlled, and there can 'be little doubt that this demonstration had a profound effect on the German services who began to realise the potential value of the helicopter in warfare. The Fa 61 carried side-by-side rotors on outrigger arms, each consisting of three articulated blades. Longitudinal and directional control were provided by cyclic pitch, and lateral control was achieved by increasing the angle of the blades of one rotor simultaneously decreasing that of the other, the resultant differential increasing the lift on the desired side. Power was provided by a 160 h.p. Bramo Sh 14A radial air-cooled engine, and two proto-types were built, the Fa 61V1 (D-EDVU) and the Fa 61V2 (D-EKRA). Late in 1938, the German Navy requested a much larger and more powerful helicopter which could be used for protecting convoys and as a substitute for E-boats in mine-laying and torpedo attacks, and design of the Fa 223 Drache was initiated. The specification stipulated that the helicopter had to be capable of carrying a 1,540-lb. payload. The first prototype, the Fa 223Vl which bore the civil registration D-OCEB, was completed in the summer of 1939; and after a 100.hour ground test, the first test flight was made on August 3, 1940. The Fa 223VI, like its predecessor, had side- by-side three-bladed rotors mounted laterally on steel-tube outrigger arms. The welded steel-tube fuselage was fabric-covered and accommodated a crew of two in an extensively glazed nose. Behind the flight compartment was a cabin for four passengers or freight, and aft of this was situated the engine bay which contained a 980 h.p. BMW 323 air-cooled radial mounted on flexible rubber supports, and driving the rotors by means of shafts through a friction clutch from the engine crankshaft. During an examination at the Rechlin test centre on October 28, 1940, the Fa 223Vl, with Karl Bode at the controls, and ballast to the equivalent of a full payload, attained an altitude of 23,294 feet! At this altitude, the helicopter's climb rate was still between l00 and 200 ft. / min. The spectacular results of these altitude tests- which were closely guarded secrets at the time- resulted in the suggestion that the Fa 223 should be used for an attempt to climb Mount Everest! The maximum level speed attained during the Rechlin tests was 115.5 m.p.h. Some difficulties were experienced with torsional vibration resulting from the rotors revolving out of phase. The second prototype, the Fa 223V2 (D-OGAW), incorporated all the experience gained during the testing of the first machine, and offered substantial improvements. At one time, two-blade rotors were tested. This machine was intended for a new helicopter speed record, and it was anticipated that a level speed of 137 m.p.h. would be reached, however, before the full speed range of the helicopter had been examined, the machine was destroyed in a bombing attack. In the meantime, production of an initial series of one hundred helicopters bad been initiated for the German armed forces, under the designation Fa 223E Drache, at Delrnenhorst and Oxenhausen. The Fa 223E was generally similar to the Fa 223V2 but featured several modifications to suit it for military duties. Bulky loads could be attached beneath the fuselage, enabling cargoes to be picked up and set down without landing. Among test loads were a military Volkswagen staff-car and a disassembled Fieseler Fi 156C Storch monoplane. Normally, a 1,000 h.p. Bramo 323Q-3 engine was installed, and in 1944, a two-stage supercharger was fitted, and tests undertaken with water-methanol injection which boosted maximum output to 1,200 h.p. During one test, a Fa 223E carried a 1,100-lb. load to the top of the "Dresdener Hütte " (7,546 ft.), near Mittenwald, Karwendel. Torpedo dropping tests were not successful, however. Bombing severely disrupted production of the Fa 223E, and ; only some twenty machines were actually completed. It is of interest to note that one of these was to have been used to liberate Benito Mussolini from his mountain prison, but the helicopter went unserviceable at the last moment. The Fa 223 attained a. maximum speed of 124 m.p.h., and had a range of 200 miles at 86 m.p.h. Vertical and oblique climb rates were 650 ft./min. and 1,260 ft./min. respectively, absolute ceiling was 16,000 feet, and endurance was 2 hr. 20 min. Empty and loaded weights were 7,500 lb. and 9,460 lb., and overall dimensions were: fuselage length, 40 ft.; overall span, 80 ft. 4 in. ; height, 14 ft. 3 5/8 in. ; rotor diameter, 39 ft. 4 1/8 in. although it crashed early in the test programme and was a total write-off. One was rebuilt in France and extensively tested under the designation SE-3000, while yet another was reconstructed by the Avia factory in Czechoslovakia for tests under the designation VR-1. 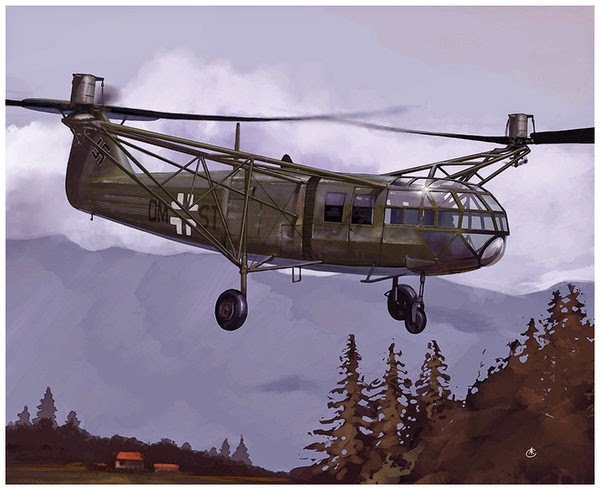 The Focke-Achgelis concern did a considerable amount of development work during the war years on rotorcraft other than the Fa 223 Drache. One of the earliest of these was the Fa 224 Libelle, a side-by-side two-seat training and sports helicopter based on the Fa 61 and powered by a 270 h.p. Argus As 10 engine. The Libelle, which was never completed, had an estimated maximum speed of 99 m.p.h., a vertical climb rate of 300 ft./min., and an inclined climb rate of 790 ft./min. The Fa 225 was the fuselage of a DFS 230 transport glider married to a Fa 223 rotor head. This was intended to serve as an assault glider for use in confined spaces, but tests were not entirely successful and development was abandoned. The Fa 266 Hornisse was a commercial helicopter based on the design of the Fa 223. Powered by an 840 h.p. Bramo radial, the Hornisse was somewhat smaller than the Drache and was intended to carry a crew of two and three or four passengers, but the sole prototype was never completed. The Fa 283 was a proposed multi-purpose helicopter with a fully retractable undercarriage. The proposed power plant was a BMW 801 radial, and an interesting feature of the design was the "Blas-Heck" (Blow-Tail) exhaust pipe intended to counteract the torque of the single three-blade rotor. The Fa 284 was a "flying crane" project powered by two BMW 801 radials. This immense helicopter had twin 59-ft. diameter rotors mounted at each end of a transverse beam, and it was proposed that a large rectangular freight pod would be attached beneath the fuselage. Prototype construction commenced but owing to the difficulty of obtaining the very large bevel gears called for, work on the Fa 284 had , to be shelved and, instead, a scheme was proposed for attaching two Fa 223 Drache helicopters behind each other to form a four-rotor helicopter, but this proposal , was never to reach fruition.